Leawo Blu-ray Ripper for Mac not only maintain the versatile functions to flawlessly rip Blu-ray/DVD to HD and common video and audio formats on Mac such as M2TS, AVI, MP4, WMV, FLV, MPEG, AAC, MP3, etc for various portable players; In addition, it also include other user-friendly features: 2D to 3D conversion, video editing features, parameter settings, batch conversion, merge into one file, etc. 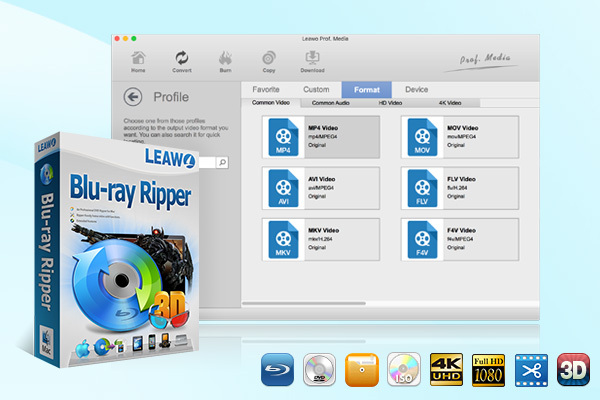 Leawo Mac Blu ray Ripper is perfectly made for Mac OS users to rip Blu-ray to video, as well as rip DVD to video, and edit, convert and backup the content of a Blu-ray disc to hard disk or portable players. The ability to rip the latest Blu-ray MKB level of AACS and BD+ discs protection makes it the best choice for Mac users. This Blu ray Ripper Mac specializes to rip Blu-ray to video to backup on hard disk in different HD and common video formats like M2TS, AVI, MP4, WMV, FLV, MPEG, MOV, MKV, RMVB, etc. or portable players like iPhone, iPod, iPad, PSP, PS3, Apple TV, Zune, Xbox 360, Blackberry, Archos, Creative Zen, etc. for freely Blu-ray movie enjoyment on the go. Also, this Mac Blu-ray ripping software provides user-friendly Blu-ray and DVD video editing features: trim video length, crop video size, rotate video for a special angle view, adjust video effect and add image or text watermark. Meanwhile, this Bluray ripper for Mac enables users to convert 2D to 3D for 3D movie enjoyment. Other wonderful bonus features: built-in player for preview with screenshot capture, merge into one file, batch conversion, NVIDIA CUDA accelerating tech for fast processing, output parameters customizations, etc.